Steel pipe welding clamps are useful tools tool align pipes in the pipe welding process. They have been designed to offer the operator safety alignment of two pipes. Our steel pipe welding clamps are made of forged steel and provide sufficent clamping force to fulfill the requirements for all pipe diameters within the from 1"-14" (25 mm - 355 mm). The balls of the thumbscrews are made of stainless steel. The robust pipe clamps with the strength to align and reform, that is also lightweight and easy to operate. 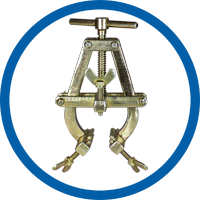 The Clamps can be used for centering and alignment of steel pipes before pipe welding. 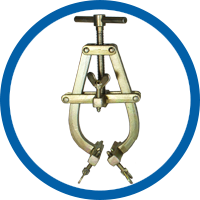 To align stainless steel pipes, duplex and other alloyed pipes we recommend the use of our stainless steel pipe clamps. 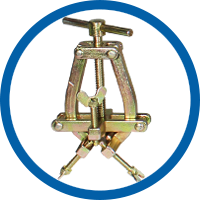 All Pipe Clamps are easy, safe and quick to use. 5 several types ensure that the usual pipe diameters are covered. 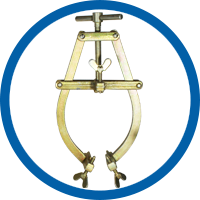 One pipe welding clamp can align a variety of pipe diameters. 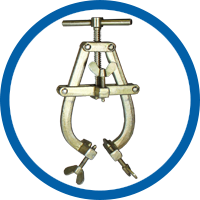 For larger pipe diameters we recommend the use of our pipe chain clamps.